The disentangled and folded lightcurves of the 3.595-day ‘A’ binary and the 0.618-day ‘B’ binary (red dots). The black curves represent the disentangled, folded lightcurves, obtained from the simultaneous lightcurve solution. In the case of binary B the grey dots represent the sum of the disentangled, folded lightcurve and a simple model of the rotational spot modulation. The bottom panel for each binary shows the folded, disentangled residuals of the full K2 data from the model fit. Credit: Borkovits et al., 2018. Using NASA's Kepler spacecraft, an international group of astronomers has discovered a doubly eclipsing, bound quadruple star system. The newly found system, designated EPIC 219217635, consists of stars similar in size to our sun, with masses ranging from 0.41 to 1.3 solar masses. The finding was presented May 24 in a paper published on arXiv.org. The Kepler exoplanet-hunting telescope lost its two reaction wheels in 2013. Its mission was repurposed, and is now known as K2. The main goal of the revived spacecraft is to perform high-precision photometry of selected fields in the ecliptic. So far, the K2 mission has detected over 300 extrasolar worlds and many new stellar systems. EPIC 219217635 was initially identified by K2 as a potential quadruple star system during the spacecraft's Campaign 7, which took place in late 2015. Afterward, a team of astronomers led by Tamas Borkovits of the Baja Astronomical Observatory of Szeged University, Hungary, has conducted follow-up observations of this star, which included radial-velocity spectroscopy, adaptive optics imaging, as well as ground-based photometric observations. "In this work we report the discovery with NASA's Kepler space telescope during Campaign 7 of its two-wheeled mission (hereafter referred to as 'K2') of a quite likely physically bound quadruple system consisting of two eclipsing binaries," the researchers wrote in the paper. The astronomers found that EPIC 219217635, located some 2,800 light years away from the Earth, is composed of two eclipsing binaries with orbital periods of about 3.6 and 0.62 days. The binaries are most likely in a 20 AU orbit around each other. EPIC 219217635 A consists of a star about 20 percent larger and more massive than the sun, and its smaller companion – with a radius of 0.74 solar radii and a mass of 0.68 solar masses. The larger component is about 2.24 more luminous than the sun and has an effective temperature of 6,473 K. The smaller star is less luminous and cooler, with a luminosity of 0.19 solar luminosities and an effective temperature of 4,421 K.
The primary star of EPIC 219217635 B is approximately 30 percent larger and more massive than our sun. It has an effective temperature of 6,931 K and a luminosity of 3.66 solar luminosities. When it comes to the secondary star, it is similar in size to the sun (1.04 solar radii) and has a mass of only 0.41 solar masses. Its effective temperature is 4,163 K and its luminosity was calculated to be about 0.29 solar luminosities. Additionally, the researchers found that EPIC 219217635 B is evolved, and in this binary cooler and currently less massive star has transferred much of its envelope to the currently more massive star. In concluding remarks, the astronomers noted that EPIC 219217635 is a promising target for future observations even with small telescopes. "The system is sufficiently bright that the eclipses can be followed using small ground-based telescopes, and that this system may be profitably studied over the next decade when the outer orbit of the quadruple is expected to manifest itself in the eclipse-timing variation and/or radial velocity curves," the paper reads. We have discovered a doubly eclipsing, bound, quadruple star system in the field of K2 Campaign 7. 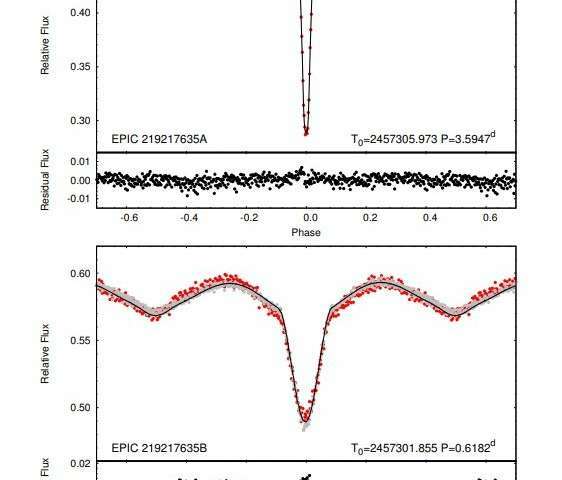 EPIC 219217635 is a stellar image with Kp=12.7 that contains an eclipsing binary (`EB') with PA=3.59470 d and a second EB with PB=0.61825 d. We have obtained followup radial-velocity (`RV') spectroscopy observations, adaptive optics imaging, as well as ground-based photometric observations. From our analysis of all the observations, we derive good estimates for a number of the system parameters. We conclude that (1) both binaries are bound in a quadruple star system; (2) a linear trend to the RV curve of binary A is found over a 2-year interval, corresponding to an acceleration, γ˙=0.0024±0.0007 cm s−2; (3) small irregular variations are seen in the eclipse-timing variations (`ETVs') detected over the same interval; (4) the orbital separation of the quadruple system is probably in the range of 8-25 AU; and (5) the orbital planes of the two binaries must be inclined with respect to each other by at least 25∘. In addition, we find that binary B is evolved, and the cooler and currently less massive star has transferred much of its envelope to the currently more massive star. We have also demonstrated that the system is sufficiently bright that the eclipses can be followed using small ground-based telescopes, and that this system may be profitably studied over the next decade when the outer orbit of the quadruple is expected to manifest itself in the ETV and/or RV curves.